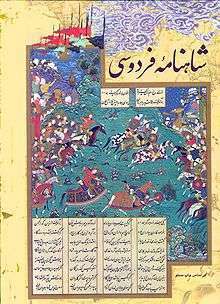 The Darab-Naameh (Persian: داراب‌نامه‎‎) (Book of Daaraab) is a Persian prose romance, written by the 12th-century writer Abu Taher Muhammad, in which the adventures of the Kayanid Iranian King Darab are recounted. The story, written in prose, is about the adventures of the legendary king Darab, the son of Bahman, and Homay. Homay is the daughter of king Sam Čarash of Egypt. Homay, gives birth to Darab, but he sets him afloat in a box on the Euphrates. By the age of 13, Darab has already proven his power and youth. He is told by the launderer that he was found and sets out to find his true parents. Finally, he meets his mother and they are reconciled. However, it was not yet time for Darab to assume the throne, so he sets off on series of adventures in the land and sea. In Oman, he falls in love with a queen Tamrusia who was widowed and was of Greek origin. They flee Oman together by ships for the islands of Greece. The lovers encounter many obstacles including the storms of the sea, talismans, cannibals and sea monsters. But through prophetic dreams, magical cures, divine intervention and the heroic acts of Darab, they are saved. However, circumstances separate the two, and Darab who is now thirty years old, reaches an island. In the island, he marries the former king's daughter and is crowned king. Meanwhile, Tamrusiya meets her brother Mehrasb, and they undergo adventures in the Greek islands. Circumstances lead to their separation and Mehrasb marries a mermaid (Dokhtar-e-Abi). Four year later, Tamrusiya returns to the sea. Mehrasb also sets sail, reaching an island of one-eyed people. Mehabs becomes their king and marries Gowharasa, the former king’s widow, whose sister Zankalisa has married Darab. Gowharasa dies, and Mehrasb kills all her family. When Darab learns of the massacre of the family of Gowharasa, he conquers the island and takes Mehrasb as prisoner. Tamrusia reaches Darab's island, and they get married. Darab's other wife, Zankalisa, also arrives and kills her rival, but a new born son of Tamrusia survives. Darab names this son by his own name "Darab". Zankalisa later is poisoned by a snake bite and dies. Darab ad his son set out to return to Persia. While passing through Oman, Darab leans that his mother Homay was defeated in the battle against the Caesar of Rome, who is descendant from Shahnameh mythical hero Salm, the son of Fereydun (a hero from the Shahnameh). Thus the Caesar of Rome is also distantly related to Darab. Darab prepares to aid Homay, but before he can reach her, Homay is captured in Ray (ancient name for a part of modern Tehran). Darab rescues her, and she turns the throne to him. Caesar of Rome is eventually captured and is held in Estakhr (a place in modern Fars province). Further fighting results in the defeat of Filqus, the brother of the Caesar. He is captured by Darab, and Darab demands his daughter Nahid (Old Persian Anahita, which also meant Venus) as a tribute. Nahid and Darab are married, however Darab sends her back to her, because of her bad breath. However, Nahid is impregnated by Darab before being sent back. In secret, she gives birth to Alexander (Alexander the Great). In order to avoid a scandal, she lives him on a mountain where Aristotle has his retreats. Alexander the Great is found by an old woman, who takes care of him, nourishes him and rears him under the supervision of Aristotle. 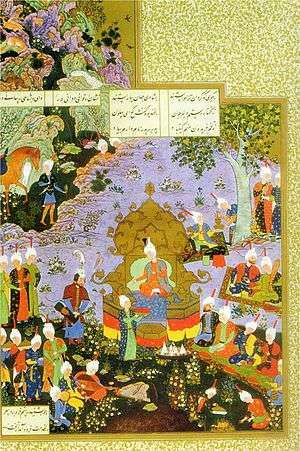 At the same time, Darab passes away and his son, also named Darab becomes king of Persia. Alexander the Great at this time stars his conquest of Persia, and he and Darab (the son), who are half-brothers, finally meet on the battle field. 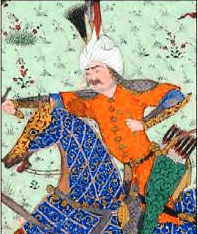 Darab is killed during this battle, and while dying, Alexander comes to see him. One of the last requests of Darab before dying was that Alexander marry his daughter, Rowshanak (also named Buran-Dokht). However, Rowshanak (compare to Roxanna in Greek sources for an Iranian princess married by Alexander) is not happy about this marriage. Rowshanak, being a warrior and warlike woman herself, raises an army to do battle against Alexander. Battle rages in several places from Aleppo to Estakhr in Fars. Alexander finally captures Rowshanak. She again refuses to marry him and escapes from Alexander. Subsequently, after more fighting around Estakhar, Alexander surprises Rowshanak while she is bathing. Finally, she agrees to marry Alexander. After they are married, Alexander installs Rowshanak as the queen of Persia and sets off for other lands. His primary aim now is conversing with sages and seeking the Water of Life (foundation of youth where whoever drinks from it lives forever). He first sets off to India where he encounters the Indian King Kaydavar.with, or aided by, water. This king resists Alexander so strongly that he is forced to send Rowshanak for reinforcement. Rowshanak leaders a Persian army into India and captures Kaydavar. Rowshanak continues to aid Alexander in other missions, particularly against wizardry and magic. This is because she is divinely protected against natural hazards. In India Rowshanak and Alexandar have several adventures where she is aided by the water. After the campaign in India, Alexander sets sail for the Arabian Peninsula. He passes through Mecca and pasuses in Egypt. In Egypt, Rowshanak and her part way and they do not meet again. Rowshanak returns to Persia and Alexander heads west in search of the Water of Life. The story ends when Alexandar dies in Jerusalem and Rowshanak dies shortly after in Persia.